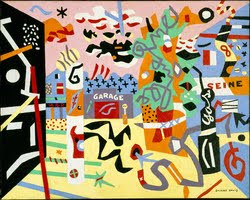 Stuart Davis was born on December 7, 1894 in Philadelphia, Pennsylvania. Davis went to art school at the New York School of Art. One of Stuart Davis’s famous paintings is “Report from Rockport” painted in 1940. 1. Davis artwork was heavily influenced by jazz music. He felt that jazz was the musical counterpart to abstract art. 2. Davis’s mother was a sculptor. 3. Davis was one of the youngest artists to exhibit in the famous Armory Show in 1913. Davis died on June 24, 1964 in New York City. Actually Jacqueline – you got the day right but his birth year is often wrongly quoted as 1894 when in fact it was 1892. Apart from myself – you may be the only person that noticed today. Thank you so much for your lovely comment. It's a real treat to know that someone like you is reading my blog.